The Core P5 does not only raise possibilities for creativity, but also for presentation of the hardware on a new level! The modular build of its case allows for three different positioning options (horizontal, vertical, and mounted to a wall). Uncover the astonishing with the P5 Core case's large panoramic window and show off your system like never before. 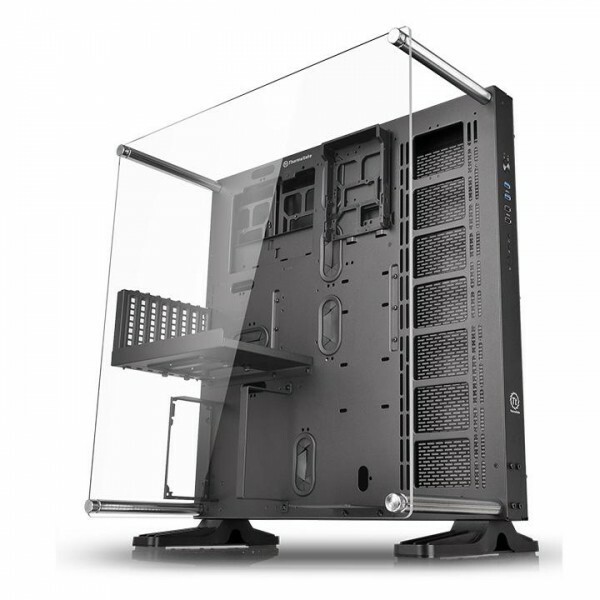 The acrylic glass protects the components and allows for a unique view into your case. The Core P5 is predestined for watercooling with radiators up to 480mm long and corresponding mounting points for pumps and equalizing tanks. Seeing is believing, and with the Core P5 you can make the unbelievable a reality in your PC, no matter how you set it up. "Tt LCS Certified" is a seal which is given to Thermaltake cases which meet the special requirements and standards in supporting liquid cooling. Enthusiasts can rely on the fact that only authentic LCS cases, whose materials and design meet all the requirements for DIY watercooling, carry this seal. The Tt LCS Certificate is intended for all power users who want to be able to tell at a glance which cases have been tested and designed for compatibility with watercooling, in order to get the best possible cooling performance. In support of "Maker Movements" among modders and PC enthusiasts, the Core P5 is deliberately open-ended and offers many opportunities to incorporate your own ideas. No two builds will look alike. Files with suggestions for expansion with the help of a 3D printer are being prepared by Thermaltake for the near future. Four modular 3.5" or 2.5" hard drive slots enable quick changes of hard drives or SSDs. If you would rather have the full 45mm of space in the rear side for cable management, you can remove these slots. The Core P5 can be positioned in three different ways. Depending on your requirements or personal taste, the Core P5 can be mounted on a wall, stood up verically or laid down horizontally. This way, the case looks good in any situation. Most cases on the market are closed on the sides. The Core P5 was intentionally designed openly, in order to lift the presentation of the hardware and customization options to new heights. The large acrylic glass panoramic window underscores this principle. The Core P5 is 100% equipped for watercooling. The right side supports a radiator from 120mm to 480mm in length, which is enough cooling power for up to four components. Long graphics cards can be mounted horizontally or vertically, and diverse mounting points for a pump and equalizing tank make installing a watercooling system possible without much preparation. Playful light effects and sophisticated modifications are always visible, thanks to the open design. Ich würde gerne wissen wie viel mm Platz zwischen dem Acrylscheibe und dem Gehäuse ist und die Stärke von der Acrylscheibe wäre auch noch super. Vielen dank schon mal im Vorraus! Können wir leider nicht mitteilen, da sich das Gehäuse in unsrem Außenlager befindet und eine Kontrolle diesbezüglich nicht möglich ist. Ein 480er System bietet sich hier sehr gut an und wurde schon oft verbaut. Nähere Angaben dazu gerne im Emailverkehr.